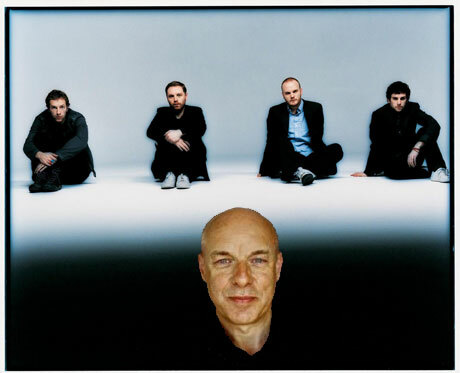 Coldplay have apparently returned to the studio with famed egghead Brian Eno. Via a Twitter update (the latest source of breaking music news), the knitting Brit soft-rockers "announced" they are recording with the producer again for a few weeks before trekking off to tour Japan. In many ways, this titbit of news all makes sense. Eno previously did the band's last full-length, Viva La Vida or Death and All His Friends, whose sessions were "incredibly fruitful" Chris Martin told the Telegraph last year. In fact, the Coldplay front-man said working with Eno went so well last time around that "the majority of the follow-up is already in the can," adding that the band were toying with the idea of a "surprise album." However, the Twitter message made no indication of what Coldplay plan to do with the new Eno recordings. In other Twitter-leaked news, we've recently been informed that David Bowie is again recording in Berlin, Sonic Youth are in the mixing stages of their Matador debut and Lil Wayne is "chilling".